As our fellow political junkies know, for some time now we’ve been showing photos of unknown buttons, arranged alphabetically by candidate names, for you to help identify. We can’t make heads or tails of these candidates, most of whom we’ve never heard of. And when we see a “Smith for Congress” or a “Jones for Senator” button, how do we know which Smith or which Jones? So we’ve been posting pictures of these buttons, hoping you will have the answer. Often, you have come through, which is most appreciated. We’re not convinced all of these are political; we have no idea, frankly. But we sure could use your help in identifying those you might recognize (see notes below). ROW 1: I was told many years ago that the 6th button may be for a New York gov. candidate. ROW 2: First button reads, “KOTM Wisconsin / Our Leaders.” Second button has “L.A. Greyer Co./Boston” backpaper. Last button in row, which says, “For Mayor/Railroad Club,” may be for Tom Taggart of Indianapolis? Who Will Be The First GOP Candidate To Drop Out? I saw it in a Hake Auction in the 4th qtr. 2002. ‘Man in Dearborn’ look like the former (RIP) Mayor Orvil Hubbard. Widely known for his anti-minority stances. Top row 3rd from left, J. Hampton Moore Mayor of Philadelphia. Last in top Row is Thomas Reed. 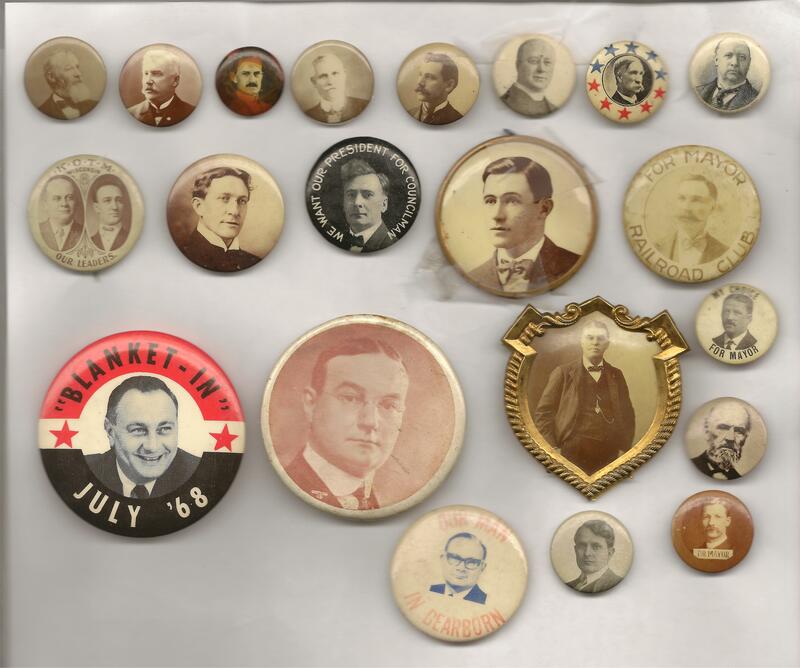 Bottom row: Orville L. Hubbard, mayor of Dearborn from 1942-1978. Kathy, are you sure about this? Every picture I’ve seen of Hubbard has him with a bow tie and no glasses.